This post deserves to be read by everyone who wants to see how far Austrian economists (and, incidentally, even mainstream New Keynesians like Mankiw) are from understanding real-world capitalism. Keynes was clear that even if wages and prices were perfectly flexible this would still be no reliable and automatic cure for involuntary unemployment, and that there could still be failures of aggregate demand (Davidson 1992). Keynes, then, would not have been a New Keynesian like Mankiw. But the issue here is wage stickiness. First, Murphy does not even dispute that wage stickiness is a real phenomenon in modern market economies (what is now called a “stylised fact”), but instead wishes to put the blame for it mostly on modern governments. “Now we have to ask, why do workers hold out for so long without jobs, insisting on wages that no one is willing to pay? After all, the other goods and services in the economy see their prices fall in a speedy fashion even though the sellers of these items depend on them for their livelihood. So if a street vendor knows enough to slash his hot dog prices when demand collapses, why don’t hairdressers accept pay cuts when the same happens to their industry? What was that? Murphy is saying that real world “prices fall in a speedy fashion”? Has Murphy ever noticed that in virtually all recessions since the late 1930s throughout the developed world, even recessions tend to be inflationary? Deflation has virtually disappeared. Relative price rigidity is a fact of life. Even in the terrible disaster that was the Great Depression it was a clear phenomenon. The reason has been known since the work of Gardiner Means: most prices in modern capitalist economies are relatively inflexible mark-up/administered prices (for the empirical evidence, see Appendix 2 below). Flexible price setting as required in standard economics textbooks – where prices are set by supply and demand dynamics – is largely shunned by the private sector itself. A great part of the economy of each modern capitalist nation consists of mark-up pricing sectors, but even though (of course) flexprice markets do exist they are a considerably smaller part of the economy than most people think (perhaps less than 30% in many nations). And, even though many nations saw price deflation in the Great Depression, even in the 1930s mark-up prices were significant and relatively inflexible as compared with other markets: Gardiner Means, for example, discovered that the administered pricing sector of the US economy had seen price declines of only about 10% during the depression, whereas the more competitive or flexprice sectors had seen price falls of about 40 to 60% (Means 1975). So even Robert Murphy’s initial assumption that we live in a world of highly flexible prices cannot be taken seriously, and utterly collapses. But to return to the issue of sticky wages. The main cause of sticky wages is not government intervention. The empirical evidence that has accumulated over the years shows that people in general object to having their nominal wages cut. But even managers and capitalists often dislike pay cuts. Recent studies suggest that employers avoid pay cuts because they diminish workers’ morale, and then falling morale reduces productivity, amongst many other reasons (Bewley 1999). The evidence of Bewley shows that even employers are often averse to wage cuts during recessions. A nice summary of Bewley’s work on wages is available here. First, Hoover’s “high wage” policy was not an alien, evil government intervention imposed on unwilling and hostile business people: it was a policy that many largely agreed with, as I note here. Already in the 1920s and 1930s many employers had grown averse to wage cuts. Secondly, Rose (2010) presents some (admittedly ambiguous) evidence that Hoover’s “high wage” policy actually did not have much effect on the timing of US wage cuts during the depression. Of course, that rigid wages in the face of falling prices squeezed profits and induced business pessimism and bankruptcy is undoubtedly true, but the solution was not wage cuts. Why? Keynes showed why in Chapter 19 of the General Theory (Keynes 1964 : 257–271), and one important reason is that, even when nominal wages fall, this induces debt deflationary effects (especially when levels of private debt are very high), just as Irving Fisher had argued (Fisher 1933; see also Dimand 1997 and Dimand 2011). Above all, if price deflation is quite uneven across sectors and product markets (as in many countries during the depression), the burden of fixed nominal debt will soar, inducing difficulty in servicing debt to many debtors and actual bankruptcy to others. A further means by which demand for final goods and services is contracted is that a greater transfer of wealth from debtors to creditors occurs and creditors often have a lower marginal propensity to consume. And eventually severe debt deflation will cause distress and bankruptcy to creditors and the financial system. So the smooth and rapid market clearing as postulated by Austrians and other mainstream neoclassicals as the cure for high involuntary unemployment simply could not and did not happen. Murphy cites the recession of 1920–1921 as an example of how (alleged) wage and price flexibility cleared markets and led to a (supposedly) quick recovery. But the recession of 1920–1921 is highly anomalous, as I have shown elsewhere (see Appendix 1 below), and a demand-side explanation is more convincing as an explanation of recovery in 1921. There was no financial crisis, no banking failures, the deflation was probably expected, some actual positive supply shocks, and private debt levels were considerably lower than in 1929. As we can see, the Fed lowered interest rates from May 1921, and a recovery began in August 1921, after looser monetary policy had been adopted. Then from November 1921 to June 1922, the Fed engaged in unprecedented open market operations to aid the recovery process. The Austrian obsession with the recession of 1920–1921 is strange, given its anomalous nature. Why don’t they look at the US recessions of the 1870s and 1890s, for example? The US had no central bank in these years, small government, a gold standard, either no or very limited unemployment relief at best, and (presumably) a greater degree of price and wage flexibility (although even in this period wage stickiness existed: see Sundstrom 1990; Sundstrom 1992; Hanes 1992; Hanes 1993). Yet serious economic problems occurred in both the 1870s and 1890s. Take the 1890s. 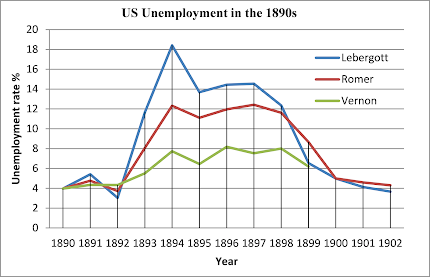 The graph below shows US unemployment in the 1890s according to three estimates. For various reasons, Lebergott’s estimates may be the better ones for unemployment rates in this period. 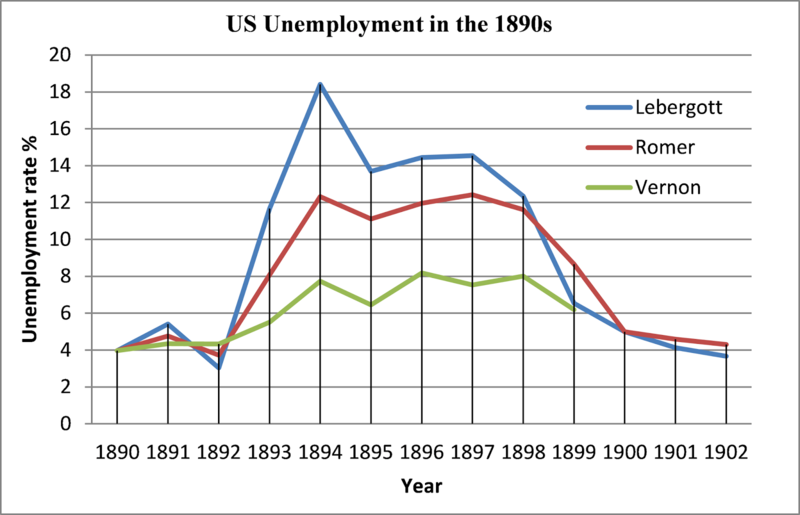 High unemployment continued for years after the shock of 1892–1893. So what is the Austrian explanation for this? If wages and prices were not sticky, then there was still no rapid recovery and quickly self-adjusting labour market. If wages were sticky, then not even late Gold Standard capitalism escaped the “stylised fact” of relatively rigid wages. Either way the Austrian view is damned. Dimand, Robert W. 1997. “Debt-Deflation Theory,” in D. Glasner and T. F. Cooley (eds), Business Cycles and Depressions: An Encyclopedia, Garland Pub., New York. 140–141. Dimand, Robert W. 2011. “Lessons from the 1929 Crash and the 1930s Debt Deflation: What Bernanke and King Learned, and what they could have learned,” in Claude Gnos and Louis-Philippe Rochon (eds. ), Credit, Money and Macroeconomic Policy: A Post-Keynesian Approach. Edward Elgar, Cheltenham. 33–44. Means, Gardiner C. 1975. “Simultaneous Inflation and Unemployment: A Challenge to Theory and Policy,” in Gardiner C. Means et al., The Roots of Inflation: The International Crisis. Wilton House Publications, London. Sundstrom, William A. 1992. “Rigid Wages or Small Equilibrium Adjustments? Evidence from the Contraction of 1893,” Explorations in Economic History 29.4: 430–455. Funny you use that quote, Salerno, because it would appear to be a perfect description of how you (and other Austrians) treatment me and my blog. First of all, arguments stand and fall on their own merits, not on the obscurity or identity of the author. But it appears Salerno doesn’t agree with that and resorts to exactly the tactics described above. “The crisis from which we are now suffering is also the outcome of a credit expansion. The present crisis is the unavoidable sequel to a boom. Such a crisis necessarily follows every boom generated by the attempt to reduce the ‘natural rate of interest’ through increasing the fiduciary media. However, the present crisis differs in some essential points from earlier crises, just as the preceding boom differed from earlier economic upswings. The most recent boom period did not run its course completely, at least not in Europe. Some countries and some branches of production were not generally or very seriously affected by the upswing which, in many lands, was quite turbulent. A bit of the previous depression continued, even into the upswing. On that account—in line with our theory and on the basis of past experience—one would assume that this time the crisis will be milder. However, it is certainly much more severe than earlier crises and it does not appear likely that business conditions will soon improve. The unprofitability of many branches of production and the unemployment of a sizable portion of the workers can obviously not be due to the slowdown in business alone. Both the unprofitability and the unemployment are being intensified right now by the general depression. However, in this postwar period, they have become lasting phenomena which do not disappear entirely even in the upswing. We are confronted here with a new problem, one that cannot be answered by the theory of cyclical changes alone.” (Mises 2006 : 163–164). So it appears that Salerno either (1) did not read the post or (2) did not read it properly or ignored what I actually said. Since Salerno later repeats one of my quotations from Mises, it would appear to be (2). But if Salerno did not read the post properly or “ignored” what I said, then Salerno appears to have fulfilled the first of these failings of his quotation (“First they ignore you, then they laugh at you, then they fight you, then you win”). It also follows that Salerno’s charge that my post was “a caricature of Mises’s position” is a straw man, though perhaps unintentionally. This is reinforced when Salerno borrows a quotation of mine from Mises and uses it to prove that “Mises did not deny that the Great Depression was initiated by credit expansion.” That is correct, but then I did not assert that Mises abandoned his business cycle theory. Salerno’s following charge that Krugman is unable “to grasp a multi-causal explanation of a complex and multifaceted historical episode” that was the Great Depression is so stupid, it’s laughable, and is actually more appropriate for the grossly oversimplistic explanation of Mises himself, who ignored the complex factors in the 1930s that thwarted any strong inducement to hire labour and clear the labour market via lower wages, such as the level of demand for output, the degree of uncertainty of capitalists about the future, business expectations, the general state of expectations, and the state of the financial system and credit markets, and so on. After this Salerno links to a paper by Ohanian (2009) arguing that Hoover’s “high wage” policy was a major cause of the US depression, which is rather strange because Mises was talking about the Great Depression in Europe, not the United States. Be that as it may, it is clear that, firstly, Hoover’s “high wage” policy was not some alien, evil government intervention imposed on unwilling and hostile business people and industrialists: it was a policy they largely agreed with. But secondly and more importantly, Jonathan D. Rose (2010) presents some evidence that Hoover’s “high wage” policy actually did not have much effect on the timing of US wage cuts during the depression. Thirdly, even when wages fell, this induced severe debt deflationary effects, because price deflation was quite uneven, and the burden of fixed nominal debt soared. So the smooth and rapid market clearing as postulated by Mises as the cure for high involuntary unemployment simply could not and did not happen. Next, Salerno admonishes Krugman to “stop trawling obscure blogs for biased material” on Austrians – referring to my blog. This seems like a rather good example of the second part of Salerno’s opening quote (“First they ignore you, then they laugh at you, then they fight you, then you win.”). Even the charge that my blog is “obscure” (though irrelevant) is, I think, wrong. I’ve made it into the Onalytica Influence Index’s “Top 200 Influential Economics Blogs” (August 2013). Even though I am at no. 178 (at the moment), there are thousands of economics blogs all over the internet, so I’m not quite so “obscure” as Salerno thinks. And, in point of fact, Robert Murphy seems to have already moved onto the third stage (“fighting” me): he promised here to respond in greater detail to me later this week. I look forward to that. That is priceless, because a “reformulation” implies that there was something inadequate about the original theory, which does not say much for the ABCT if it needs to be regularly reformulated. I would go so far as to say that the Austrian business cycle theory is a sad history of “reformulations” as Austrians encountered severe and cutting criticisms of their theory. For example, Hayek’s first version of the ABCT in Prices and Production (London, 1931) encountered devastating criticisms from Sraffa (1932a, 1932b) and others and he was forced to “reformulate” the theory in Profits, Interest and Investment (London, 1939). If we turn to Salerno’s new ABCT, one of the main purposes of his paper is to address the criticism that the ABCT “cannot explain the positive correlation of consumption and investment that occurs over the course of the business cycle” (Salerno 2012: 5). But such a charge against the ABCT is only one of the minor problems with the theory. The main problem with the classic ABCT was always its use of the Wicksellian natural rate of interest: an irrelevant and non-existent concept, as Sraffa showed a long time ago (Sraffa 1932a and 1932b). Outside of an equilibrium state, there could be as many natural rates of interest as there are factor inputs. So what natural rate should banks target when setting interest rates? I will leave a more detailed critique of Salerno’s paper for another post, but for the moment it is sufficient to note that Salerno (2012: 6, 37–38) invokes and indeed needs the non-existent natural rate of interest for his “new” ABCT to work, just like most of the other versions of the theory. On this point alone, Salerno’s “reformulation” of the ABCT is as worthless as any other of the pathetic “reformulations” over the years. Salerno, Joseph. 2012. “A Reformulation of Austrian Business Cycle Theory in Light of the Financial Crisis,” Quarterly Journal of Austrian Economics 15.1: 3–44. Rose, J. D. 2010. “Hoover’s Truce: Wage Rigidity in the Onset of the Great Depression,” Journal of Economic History 70: 843–870. I will deal with Joseph Salerno’s post elsewhere, and only focus on Murphy’s below. First, I did not say that Mises totally dropped his business cycle theory, and it is quite possible Krugman did not mean to imply this either (since he linked to my post), and Murphy has misinterpreted him. In point of fact, I said that “it is interesting that Mises thought that his Austrian monetary theory of the cycle could not adequately explain the severity and length of the Great Depression” (and people can read my original post and verify that for themselves). That is, Mises was forced to look for other explanations, rather like Hayek when the latter suddenly discovered the evils of “secondary deflation” as an additional cause of the length of the Great Depression. (1) Mises admits that Europe did not experience a strong boom, and that on the basis of his own theory “one would assume that this time the crisis will be milder. However, it is certainly much more severe than earlier crises and it does not appear likely that business conditions will soon improve.” That is, his theory lacked predictive power about the course of the bust after 1929. (2) Secondly, Mises said that his theory could not explain the depth and length of depression in terms of the “unprofitability of many branches of production” and the high unemployment. So my original statement is right. But ultimately this point is not that important, because the ABCT is wrong for many reasons I have explained here. And Daniel Kuehn does a wonderful job here discrediting the Hayekian version of the Austrian business cycle theory, and most of his criticisms apply also to Mises’s original ABCT. But next we come to Murphy’s hypocrisy. Murphy likes to present himself as great defender of Austrian economics, and rushes to defend the Austrian business cycle theory (ABCT) in his post, giving his devoted Austrian fans the impression that the beloved ABCT is safe and sound from the criticisms of that nasty ogre Krugman. I, however, have actually read a great deal of Murphy’s work. Now what, you may ask, is the significance of this? A substantial part of Murphy’s PhD (Murphy 2003: 58–177) is devoted to rejecting that theory generally accepted by Austrians called the “pure time preference theory of interest” and defending a monetary theory of the interest rate. But the really important point is that Murphy’s paper “Multiple Interest Rates and Austrian Business Cycle Theory” is about as damning a critique of the classical Austrian business cycle theory (dependent on Wicksell’s natural rate of interest) as you will find. Murphy accepts that the Austrian business cycle when it is based on Wicksell’s unique natural rate of interest is a flawed theory and cannot work in that form. “According to the circulation credit theory (monetary theory of the trade cycle), cyclical changes in business conditions stem from attempts to reduce artificially the interest rates on loans through measures of banking policy—expansion of bank credit by the issue or creation of additional fiduciary media (that is banknotes and/or checking deposits not covered 100 percent by gold). On a market, which is not disturbed by the interference of such an ‘inflationist’ banking policy, interest rates develop at which the means are available to carry out all the plans and enterprises that are initiated. Such unhampered market interest rates are known as ‘natural’ or ‘static’ interest rates. If these interest rates were adhered to, then economic development would proceed without interruption—except for the influence of natural cataclysms or political acts such as war, revolution, and the like. The fact that economic development follows a wavy pattern must be attributed to the intervention of the banks through their interest rate policy. …. At the interest rates which developed on the market, before any interference by the banks through the creation of additional circulation credit, only those enterprises and businesses appeared profitable for which the needed factors of production were available in the economy. The interest rates are reduced through the expansion of credit, and then some businesses, which did not previously seem profitable, appear to be profitable.” (Mises 2006 : 161). It follows that if Murphy were intellectually honest and not an evasive shill for his fellow Austrian economists, he would graciously concede that his own published work entails that he himself appears to accept that the classical Austrian business cycle theory per se (using the natural rate) cannot explain recessions or depressions. Krugman is right in rejecting the classical Austrian business cycle theory, even if not for the reasons that Murphy does. Keynesians think that demand and, above all, aggregate demand drive production and employment. Austrians also think demand drives production but in a different way. “In allocating labor and capital goods, the entrepreneurs and the capitalists are bound, by forces they are unable to escape, to satisfy the needs of consumers as fully as possible, given the state of economic wealth and technology. Thus, the contrast drawn between the capitalistic method of production, as production for profit, and the socialistic method, as production for use, is completely misleading. In the capitalistic economy, it is consumer demand that determines the pattern and direction of production, precisely because entrepreneurs and capitalists must consider the profitability of their enterprises. In the final analysis, it is the consumers who decide what shall be produced, and how. The law of the market compels entrepreneurs and capitalists to obey the orders of consumers and to fulfill their wishes with the least expenditure of time, labor and capital goods. Competition on the market sees to it that entrepreneurs and capitalists, who are not up to this task, will lose their position of control over the production process. If they cannot survive in competition, that is, in satisfying the wishes of consumers cheaper and better, then they suffer losses which diminish their importance in the economic process. If they do not soon correct the shortcomings in the management of their enterprise and capital investment, they are eliminated completely through the loss of their capital and entrepreneurial position. Henceforth, they must be content as employees with a more modest role and reduced income.” (Mises 2006 : 156–157). (2) but for Austrians it is primarily “price signals” and free competition that drive production: demand for a product may emerge or increase, and the price of that product will rise because of the increased demand. The higher “price signal” and higher profits available in that product line, as compared with other markets with lower profits, zero profits or losses, will cause businesses to move into the more profitable market and produce more of that good. (3) eventually the increased production will tend to drive prices down towards marginal cost, and, when the price reaches this point, businesses will cease to increase production, and look for better profit opportunities elsewhere. To the extent that (1) a market really does have flexible prices caused by dynamics of supply and demand, (2) the good can be produced in a reasonably elastic way, and (3) freedom of entry is not difficult, the Austrian story, more or less, applies to a minority of markets, except for point (3) above, since marginal cost is usually irrelevant for most firms. But, apart from point (1) (which itself requires qualification), the Austrian view is, generally speaking, wrong, because it fails to consider the role of mark-up pricing/administered price industries and businesses. (2) in reality, it is not “price signals” but “quantity signals” – in the sense of the quantity of a good demanded – that drive a great deal of production and employment (Kaldor 1985: 25). This is because very many firms use mark-up pricing and generally shun flexible prices. Businesses will mostly keep the price of their products unchanged when demand changes, and instead will employ the following means (not necessarily in this order): (1) use inventories to meet changes in demand, (2) increase excess capacity utilisation, and (3) increase worker overtime and/or increase employment. Even when stocks or inventories cannot be drawn upon, (2) or (3) are the normal responses. Some empirical evidence confirms this. In a survey of 654 UK businesses, the firms were asked: what does the business do when there is a boom in demand which cannot be met from stocks or inventories? Most UK firms said they simply increase overtime of workers (as reported by 62% of firms), hire more workers (12%), or increase capacity (8%) to produce more output, rather than increase the price of their product (Hall et al. 2000: 442). Only 12% said they would increase the price of their product (Hall et al. 2000: 442). (3) So, first of all, a significant increase in demand will not generally cause a price increase, and so the Austrian view of how firms seek profit is grossly unrealistic in many markets. Secondly, the widespread use of inventories, overtime, and excess capacity utilisation in many established markets means that severe barriers to entry exist. Existing firms will often meet increased demand without any need for new firms to enter the market, and very high demand can simply mean existing firms will build new plants and production facilities, rather than see new businesses enter their markets. Nor will increased production drive market prices to marginal cost, because mark-up pricing firms will maintain their administered price based on total average unit costs plus a profit mark-up: marginal cost is irrelevant for most firms. It follows from all this that most output and employment changes in modern market economies are liable to be driven by demand but by means of “quantity signals,” not price signals. The Keynesian policy of stimulating an economy by increasing demand will then generally increase output and employment, and not simply prices. Although booms do indeed tend to be inflationary in modern economies, nevertheless the process of inflation in a mark-up pricing world is uneven, much less intense and quite different from any crude economic theory that holds that all or most prices are flexible and simply a function of supply and demand dynamics. Benton, Raymond. 1999. “Producer and Consumer Sovereignty,” in P. Anthony O’Hara (ed. ), Encyclopedia of Political Economy: L–Z. Routledge, London and New York. 911–914. Mises, Ludwig von. 2008. Human Action: A Treatise on Economics. The Scholar’s Edition. Ludwig von Mises Institute, Auburn, Ala.
Ludwig von Mises lived through the Great Depression as Keynes did, and produced his own explanation of it. I present a critique of Mises’s explanation of the Great Depression below. First, some background. Around 1930 Mises joined an Austrian government economic commission to study the causes of the depression in Austria, along with (interestingly enough) the future Austro-fascist leader Engelbert Dollfuss (Hülsmann 2007: 614), to whom Mises was later to give economic advice (see below on this). The report of the committee blamed (1) inflationary expectations in Austria and (2) rises in taxation and government spending and increased wage rates (which had all squeezed business profits) for the inability of Austria to attract foreign capital needed to facilitate quicker adjustment and recovery from the depression (Hülsmann 2007: 614–615). But Mises was not satisfied with the report (Hülsmann 2007: 615), and formed his own explanations for the depression, which were published as various articles and papers (see Mises 2006 ; Mises 2002a ; Mises 2002b ). On February 28, 1931, Mises gave a lecture called “The Causes of the World Economic Crisis” in Czechoslovakia (Mises 2006 ). In the published version of that lecture, Mises expounded his Austrian business cycle theory (ABCT) (Mises 2006 ): 160–162), with its belief in monetary expansion driving the market rate of interest below its Wicksellian natural level, causing malinvestment which is physically unsustainable. This theory is, of course, false and untenable, for reasons explained here (in the links in section 32). Amongst the many reasons why the theory is wrong is that there is no such thing as a Wicksellian natural rate of interest, and neither the Great Depression nor booms and busts in general are explained by the ABCT because banks cannot push interest rates below a non-existent natural rate. “The unions now have the power to raise wage rates above what they would be on the unhampered market. However, interventions of this type evoke a reaction. At market wage rates, everyone looking for work can find work. Precisely this is the essence of market wages—they are established at the point at which demand and supply tend to coincide. If the wage rates are higher than this, the number of employed workers goes down. Unemployment then develops as a lasting phenomenon. At the wage rates established by the unions, a substantial portion of the workers cannot find any work at all. Wage increases for a portion of the workers are at the expense of an ever more sharply rising number of unemployed. Those without work would probably tolerate this situation for a limited time only. Eventually they would say: ‘Better a lower wage, than no wage at all.’ Even the labor unions could not withstand an assault by hundreds of thousands, or millions of would-be workers. The labor union policy of holding off those willing to work would collapse. Market wage rates would prevail once again. It is here that unemployment relief is brought into play and its role [in keeping workers from competing on the labor market] needs no further explanation. Thus, we see that unemployment, as a long-term mass phenomenon, is the consequence of the labor union policy of driving wage rates up. Without unemployment relief, this policy would have collapsed long ago. Thus, unemployment relief is not a means for alleviating the want caused by unemployment, as is link in the chain of causes which actually makes unemployment a long-term mass phenomenon.” (Mises 2006 : 167–168). The solution, then, for Mises was eliminating unemployment relief (presumably forcing the unemployed to starve and accept lower wages), cutting government spending and taxes (Mises 2006 : 175), and not only to cut wages but also to make wage determination free from labour unions (Mises 2006 : 169). How suppression of trade unions was to be achieved and their freedom of association restricted was left understated, and Mises’s feeble hope that the “formation of wage rates should be hampered neither by the clubs of striking pickets nor by government’s apparatus of force” (Mises 2006 : 169) rings hollow. How else could such suppression of trade unions be realistically achieved except by government coercion? “If the government were to proceed against those who molest persons willing to work and those who destroy machines and industrial equipment in enterprises that want to hire strikebreakers, as it normally does against the other perpetrators of violence, the situation would be very different. However, the characteristic feature of modern governments is that they have capitulated to the labor unions.” (Mises 2006 : 167). This is the point in the essay where Mises may as well have been winking at his audience to indicate what his words imply: that governments should break up and repress unions and restore labour market freedom. It comes as no surprise that Mises had praised Mussolini’s fascism in 1927 because it had (according to Mises) “saved European civilization.” Mises also contended that the “merit that Fascism … [had] thereby won for itself will live on eternally in history.” Part of the reason for this sickening praise was no doubt that Italian fascism had smashed independent trade unions. And, if that wasn’t enough, Mises was himself in the 1930s to become an economic adviser to the Austro-fascist Engelbert Dollfuss (Chancellor of Austria from 1932), who did indeed smash independent trade unions in Austria. But to return to the point at hand. Why was Mises’s wage rate explanation wrong? The reason is that capitalist investment and demand for labour is not a simple function of the wage rate or interest rate, as naïve, ignorant and incompetent Austrian ideologues like Mises thought, and many still think. The propensity to invest is a complex phenomenon involving many factors, not just interest rates and the wage rate, but fundamentally the level of demand for output, the degree of uncertainty of capitalists about the future, the expectations of business people, the general state of expectations, and the state of the financial system and credit markets, and so on. Above all, the first three factors – demand for output, uncertainty and expectations – must be considered fundamental causes of the inducement to invest for many businesses, especially those that are mark-up price enterprises with excess capacity and inventories. In the Great Depression, business expectations were shattered in an unprecedented way, as was demand for output. Simply reducing wages was no reliable or effective cure for unemployment in the 1930s (or indeed during recessions in general) when business expectations were deeply pessimistic, demand was stagnant and uncertainty about the future deep. If we also add to this the fact that many nations had banking crises and lending practices would have become deeply conservative, Mises’s focus on wages as the main cause of 1930s unemployment can be seen as the folly it was. Whatever lowering of demand for labour that might have been caused by higher wage rates during the depression could have been overcome and rendered irrelevant by effective expansion of aggregate demand. “The demand that a reduction in prices be tied in with the reduction in wage rates ignores the fact that wage rates appear too high precisely because wage reductions have not accompanied the practically universal reduction in prices. Granted, the prices of many articles could not join the drop in prices as they would on an unhampered market, either because they were protected by special governmental interventions (tariffs, for instance) or because they contained substantial costs in the form of taxes and higher than unhampered market wage rates. The decline in the price of coal was held up in Germany because of the rigidity of wage rates which, in the mining of hard coal, come to 56 percent of the value of production. The domestic price of iron in Germany can remain above the world market price only because tariff policy permits the creation of a national iron cartel and international agreements among national cartels. Here too, one need ask only that those interferences which thwart the free market formation of prices be abolished. There is no need to call for a price reduction to be dictated by government, labor unions, public opinion or anyone else.” (Mises 2006 : 169–170). Mises was blissfully unaware of what many economists were to discover in the 1930s and what Gardiner Means had already discovered: that real world price rigidities are mainly caused by the private sector itself, because most businesses adopt relatively inflexible mark-up/administered prices. The type of price setting required by Mises’s economic theory is largely shunned by the private sector itself, so that the price flexibility Mises thought would clear markets cannot be attained. Even though many nations saw price deflation in the Great Depression, even in the 1930s mark-up prices were significant and relatively inflexible as compared with other markets: Gardiner Means, for example, discovered that the administered pricing sector of the US economy had seen price declines of only about 10% during the depression, whereas the more competitive or flexprice sectors had seen price falls of about 40 to 60% (Means 1975) – a very clear disparity. Finally, there is not a shred of evidence that Mises ever understood that even if wages and price were highly flexible, the existence of fixed nominal debt impedes and thwarts his imagined type of market clearing dynamics. For if debts remain fixed and wages and prices fall (or even more disastrously if wages fall but prices are less flexible), then it is likely that debtors will face severe problems as their burden of debt soars, and most probably deflation will induce bankruptcy of debtors and then bankruptcy of creditors and banks. All in all, Mises’s analysis of the Great Depression was wrong, and he was ignorant of economics and economic reality. Austrians who still adhere to Mises’s ideas are just as ignorant and mistaken. Mises, L. von. 2002a . “The Economic Crisis and Capitalism,” in Richard M. Ebeling (ed.). 2002. Selected Writings of Ludwig von Mises: Between the Two World Wars: Monetary Disorder, Interventionism, Socialism, and the Great Depression (vol. 2). Liberty Fund, Indianapolis, Ind. Mises, L. von. 2002b . “The Myth of the Failure of Capitalism,” in Richard M. Ebeling (ed. ), Selected Writings of Ludwig von Mises: Between the Two World Wars: Monetary Disorder, Interventionism, Socialism, and the Great Depression (vol. 2). Liberty Fund, Indianapolis, Ind. 182–191. Milton Friedman understood perfectly well that central banks are vital in modern market economies to stabilise fractional reserve banking, and he rightly blamed the Federal Reserve for not intervening properly from 1929 to 1933 to stop the financial collapse. But, of course, for most Austrians – with the exception of the GMU Austrians and (probably) the radical subjectivists – central banks are an unmitigated “evil” and should not even exist. The “liquidationism” of such Austrians actually entails not only that central banks should do nothing during recessions, but also that they abolish themselves. In light of this, it is indeed no surprise that Rothbardian Austrians loathe Friedman. But it is no such thing. Milton Friedman had (from his own perspective) a coherent economic theory that accepted fractional reserve banking as part and parcel of capitalism (unlike Rothbardians), and that such a system needed a central bank to stabilise it. There is no contradiction involved in followers of Friedman praising his Free to Choose (1980) book and television series and ideas on personal liberty, but accepting the need for a central bank and even some type of monetary policy, as Friedman did.